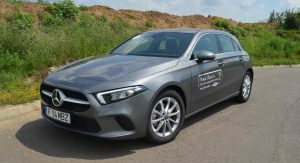 By now, you have probably seen and read many reviews of the all-new Mercedes-Benz A-Class, especially if the car is of personal interest to you as a potential buyer. The general consensus is that it’s a huge step up from its predecessor, the clear cut segment king and quite a lot more, all of them positive. Now, I don’t necessarily disagree with most of that, but after sampling the car in person, I don’t fully agree, either. 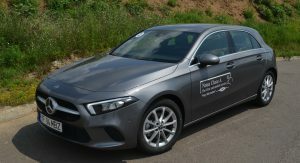 And there’s a number of reasons for not declaring the new A-Class the best thing to come out of Germany after cold beer and hot wieners. 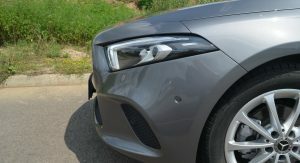 There’s no doubt the all-new A-Class has the potential to look better than its direct rivals, as long as you go for a really nice spec with decent size wheels and maybe an AMG kit. A more basic spec, just looks too basic. It’s still a novelty and the styling is pretty sleek, but to say you’ll be blown away by its appearance would be an overstatement. 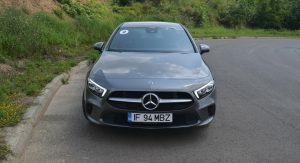 Also, you’ve probably noticed that most reviews have indeed included such well-spec’d models, featuring AMG styling and all the bells and whistles. 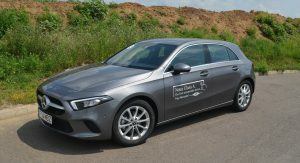 Well, here’s one where the car actually looks more like the type of A-Class most buyers will go for – and it’s not as impressive. Still, just so we’re clear, I do think it looks better than a BMW 1-Series or an Audi A3, which in most cases means half the battle is won. 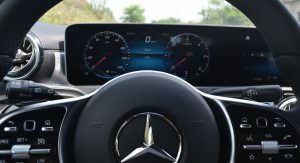 Sitting behind the wheel of the A-Class, it’s reminiscent of much more expensive Mercedes models. 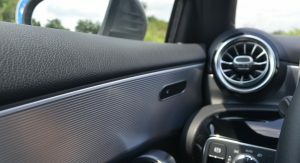 The overall aesthetic of the cabin is probably this car’s best feature, as just about every surface looks as though it belongs to something with a much higher price point. 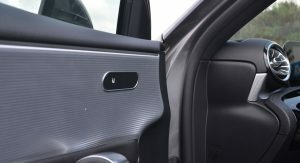 It’s not perfect, but for this particular segment, we’ve never seen an interior this stylish and high-tech. 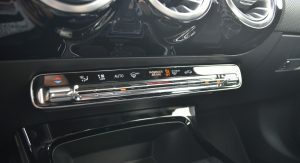 A few things that left a little something to be desired were the quality of the plastics at the very bottom of the center console, the indicator and gear lever stalks, both of which felt cheap and flimsy, and the seats, which were just OK as far as overall comfort goes. 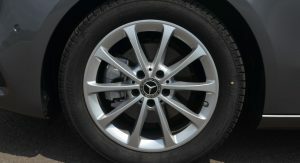 Then again, premium or not, this is the entry-level Merc, so cutting a few corners was to be expected. 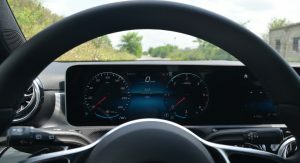 Thus, while the overall quality doesn’t beat that of the Audi A3 Sportback, the sheer design of the dashboard and all the tech you get are more than sufficient so as to kick the competition right where it hurts. 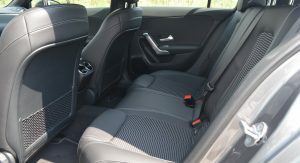 Mercedes claims that the new A-Class would be more spacious than its predecessor, and while we can attest to that being true, you can’t stretch out in the back as there’s still not a lot of knee room for people over 1.80 m (5 ft 11). 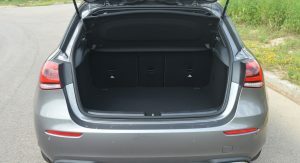 As for trunk space, there are 370 liters (13 cu.ft) available, giving you 29 liters (1.02 cu.ft) more than in the previous model. 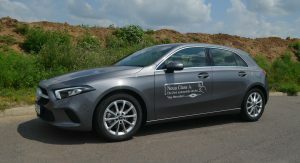 Compared to its rivals from Audi and BMW, there are 10 less liters (0.35 cu.ft) of trunk volume in the A-Class as opposed to the A3, but 10 extra liters as far as the 1-Series is concerned. Not much of a difference either way and, certainly, not a deal breaker. 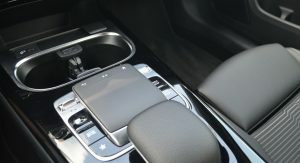 Many models today feature a long list of standard equipment which includes climate control, cruise control, sat-nav, Bluetooth, maybe a strong sound system and a number of connectivity features. 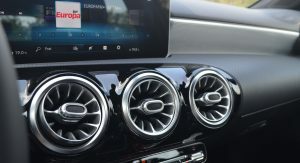 The new A-Class is miles beyond that, rocking the very best infotainment display in the segment (and not just), a clever digital assistant you can talk to as long as you begin the phrase saying ‘Hey Mercedes’, highly configurable ambient lighting (that looks awesome), and loads more. You really don’t know how clear and crisp the quality is on the dual displays until you see them in person. The user interface is also amazing, as it feels very polished and very fast. It’s almost as if you’re using an everyday tablet – only a handful of other makes/models compare. The touchpad is pretty good, too. It was very easy to use (who needs a swivel wheel? ), just like the speech recognition software, which proved a little more intuitive than your average voice assistant. Just don’t expect Siri/Google Assistant levels or cleverness, because it’s nowhere near that. 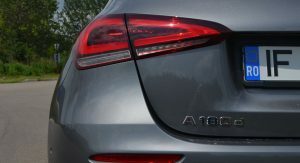 If you’re thinking about skipping the A 180d in favor of a more potent version, then good for you, but if you don’t, you might not regret it either. 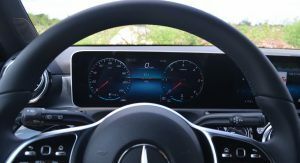 The only times the engine actually feels slow is if you’re carrying multiple passengers, luggage, or perhaps trying to push the boundaries of whichever highway speed limit you adhere to. To clarify, it’s not so much that this 1.5-liter’s 116 PS (114 HP) and 260 Nm (191 lb-ft) of torque are in any way impressive. 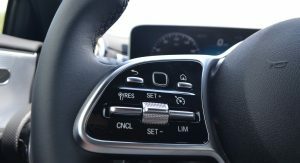 It’s the fact that the car’s 7-speed transmission is an absolute gem. 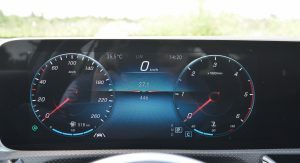 Despite its standstill to 100 km/h (62 mph) acceleration time of 10.5 seconds, the A 180d can still feel quite zippy as the fast changing gearbox flatters the engine. 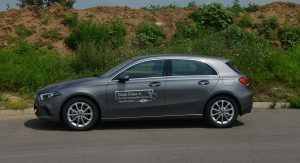 Mercedes claim an average fuel consumption of 4.9 l/100 km (48 MPG) with this car. After driving it in the city and on the highway for hundreds of miles, all we can say is: good luck with that! Yes, it’s a very fuel efficient engine overall, but you would pretty much have to be the slowest person on the road to get anywhere near that figure. 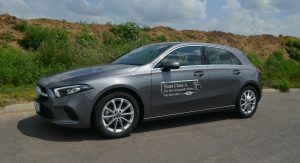 Mercedes emphasized that its new A-Class drives considerably better than the old model, but to be honest, the two felt pretty similar,although, this car wasn’t equipped with active damping control, which would have surely made a difference. 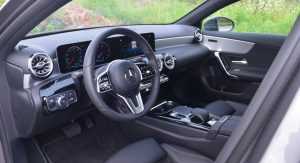 Altogether, it does go around corners slightly better than its predecessor, but you might want to save the canyon carving for when you’ve got an AMG power unit under the hood, with AMG-tuned suspension and steering at your disposal. It does the job alright, but it’s not that inspiring; not in this spec. 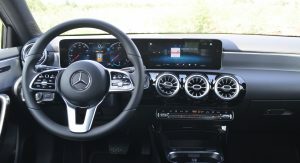 While this particular test car didn’t have any AMG goodies, it did come with the 10-inch displays, ambient lighting, heated seats, LED headlights, Thermotronic climate control, HDD sat-nav, blind spot monitoring, Parktronic and more. 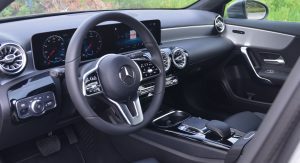 Without going too overboard, the only thing we would have added is the AMG Line pack, which brings the car closer to the road, adds the AMG bumpers, 18-inch wheels instead of the test car’s 17-inch ones and more supportive sports seats – and AMG floor mats. 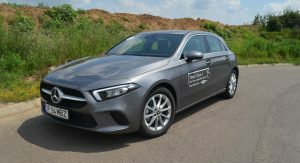 UK buyers can purchase the A 180d from £25,800 ($33,200), whereas U.S. customers can look forward to getting the 2019 A-Class exclusively as a petrol-powered 4-door Sedan, because the hatch won’t make it Stateside. 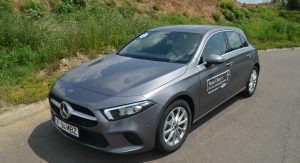 In Romania, were this car was tested, you can purchase a brand new A 180d from €31,178 ($36,000), including taxes. 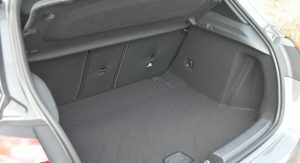 Since our test car still had plenty of optional extras on it, its final price tag stood at €41,298 ($47,600). 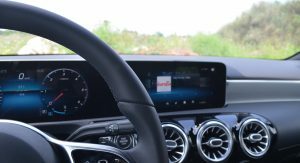 Is the latest A-Class the best car in its class right now? The answer is yes. 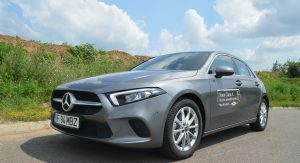 It’s stylish, well built, extremely clever from a technological standpoint, and when it’s at its best spec-wise, it can cement all those things into a customer’s head rather quickly – or at least a lot quicker than a base model would. 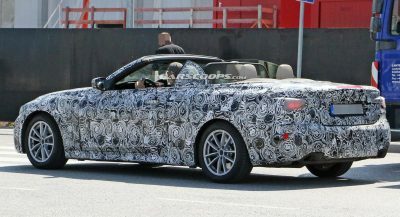 Yet, both Audi and BMW are getting ready to launch the new A3 and 1-Series in 2019, so the fight will start anew. 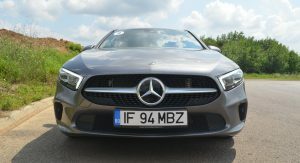 For the moment, then, the A-Class sits at the throne of its segment, but its challengers are approaching – fast. Mazda 3 is still the best choice, IMHO. 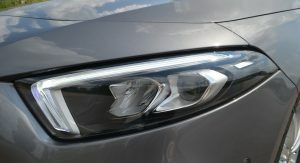 I wouldn’t even think of getting the A class without the AMG package and multibeam LEDs. 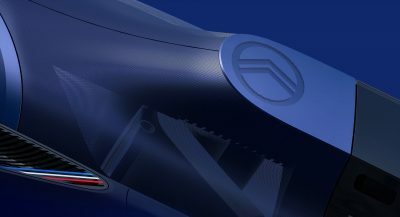 If you think to save money and still get the A class,that should never be the case,since for the price of the base A class,you can get a fully kitted hatchback from other non premium brands. 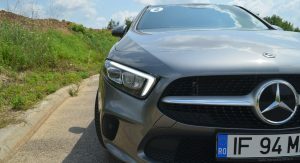 I’ve driven the A180d and A200 AMG Line. 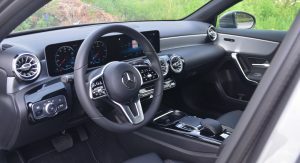 Let me first say that as a current 2007 BMW 118i E87 5-Door owner, the A-Class, even in AMG Line trim, does not come close to the driving enjoyment and feel that my BMW offers. 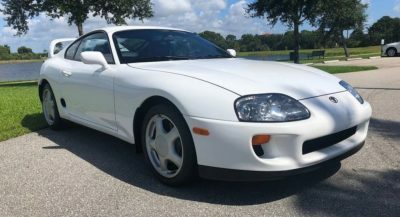 FWD vs RWD? Yes, there’s going to be differences. 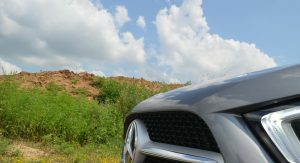 I don’t think anybody expected the A-Class to beat the [still] RWD 1-Series or even a FWD/AWD A3 in driving dynamics. 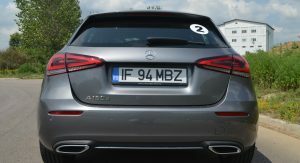 A-Class buyers are probably less concerned about sportiness than most 1er and A3 buyers. 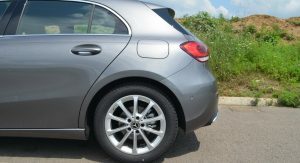 And if they do care, spec an AMG Line or go for the A35/A45 AMG. That’s the reason I went for the A250, which also has a limited slip differential. 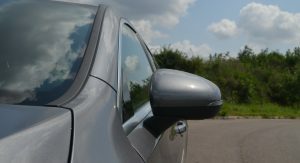 Even so, a non-AMG Line A180d and the A200 AMG Line drove competently, safely and felt very neutral. Interior wise I think the A-Class interior is good. 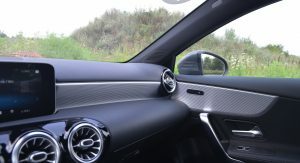 It’s not gonna blow you away like an S-Class cabin, but it does come across as premium and the design is fascinating. Perfectly adequate for its class, and better than the model it replaces. A180d and A200 AMG Line had very refined engines, especially the 1.33-l Renault-Nissan turbo-engine: wow! The diesel was decent, a little clatterish while cold but as soon as it warmed up it because quieter; much quieter. 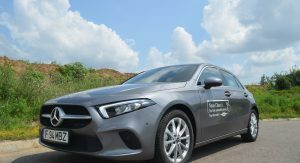 Both engines were very responsive and had no lag, especially the A200 AMG Line. Gotta say, I really liked that Renault-Nissan engine. It doesn’t deserve the hate people throw at it. Renault and Nissan know how to make good motors. 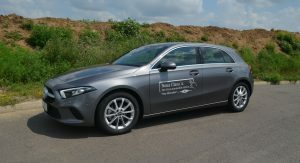 Nice car but really too expensive, and I’d like to see a true base model, without 10k euros worth of extras. 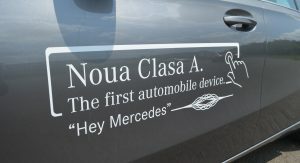 And that proves that even cheap Mercedes doesn’t come cheap.